Miniature Railway at Thornes Park01924 302385work Railway StationThe miniature railway track in Thornes Park has been in operation for over 50 years and is run on a not for profit basis by the Wakefield Society of Model & Experimental Engineers. All profits from the railway are given to the Mayor's charity fund. The railway carries about 40,000 passengers every year over its half mile, 7 and a quater inch gauge, double circuit track using mainly steam trains but also diesel trains on occasion. The miniature railway track in Thornes Park has been in operation for over 50 years and is run on a not for profit basis by the Wakefield Society of Model & Experimental Engineers. All profits from the railway are given to the Mayor's charity fund. 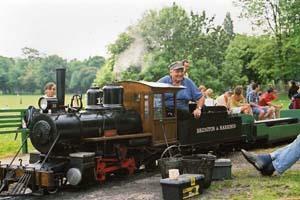 Anyone interested in getting involved in running the miniature railway should go along to the park on an operating day. Main entrance located off Horbury Road. Side entrances located off Thornes Road and Denby Dale Road.